This review is by Chris Kee, presumably the same Chris Kee who writes for Powerplay magazine (I say presumably because the Powerplay Chris Kee is a Touchstone fan — hope he’s doing our Powerplay review as well!). You may not have heard of Coralspin just yet, but they are an exciting new prog rock proposition and Honey And Lava is their incredibly accomplished debut album. The band are fronted by one time Oxford Pro Musica Singers chamber choir soloist, Ellie Blythe and her pure, natural voice is one of the most potent elements of the Coralspin sound. Her sweetly melodic tones thread their way through songs that recall the golden eras of prog giants Yes and, in particular, Genesis as well as the early work of Kate Bush. However Coralspin are not just about harking back to the past as there is a definite modern sensibility to their compositions and comparisons can be drawn to the wonderfully accessible sounds of Touchstone and The Reasoning. As with all great progressively minded music Honey And Lava does not give up all its secrets in one sitting. It’s an album that will grow in your affections with each successive play, warming your heart a little more each time, and thus ensuring its longevity. Brilliantly realised songs like ‘Sky’s End’ and ‘Nightstalker’ showcase the superlative skills of guitarist Jake Simmons and keyboard player Blake McQueen and the intuitive understanding between drummer David English and bassist Steve Knightly to wonderful effect – and underline the huge potential that Coralspin possess. Hopefully Honey And Lava will be just the start of a long and fruitful career. P.S. We only put up material from sites like YouTube where the video has been made available for public use, but if you, the copyright holder(s), would prefer us not to use it then just ask and we won’t. Sweden’s Artrock — in Swedish. I’m sure that even our most ardent fan has lost interest in reading our reviews by now, so I won’t bother reproducing them here. Just noticed we’re also on the personal playlist for June of the legendary rock journo Dave Ling. Another nice review at Prog Archives from a good young reviewer called Conor Fynes who has taken the time to listen to Honey and Lava properly (as did the other reviewer there), even though it wasn’t really his style. (We have more than one review on Prog Archives now because anyone who registers there can submit reviews). It’s refreshing to hear a band that takes the sounds of my favourite genre, and structures them in such a way that makes it accessible and instantly enjoyable to hear… Although Jake Simmons’ upbeat riffs are the meat and bones of what the band, the synthwork catches my ear the most… listeners can expect to hear McQueen and Blyth run the gamut from Baroque-style harpsichord textures to moog, ‘symphonic’ orchestration and the simple touch of the grand piano. I agree wholeheartedly with other reviewers that Ellie’s voice will likely be the ‘love or hate’ element of Coralspin that will get people talking. She’s certainly a good singer, with a voice that treads halfway between a traditional female rock performance and the stark resonance of classical opera… “Honey and Lava” is not an album that typically fits my music taste, but there are some great melodies to be heard here… Coralspin have made their potential clear here; the only way to go is up. 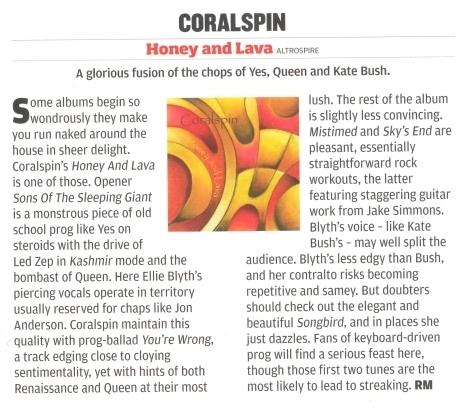 Prog magazine streaking to Coralspin! Not sure who the reviewer ‘RM’ is, as they have three reviewers listed on the masthead with those initials: Rachel Mann, Rhodri Marsden and Rob Monk. Interestingly this review seemed to be the complete opposite to Geoff Barton’s review in stablemate magazine Classic Rock, in that Geoff hated the first track ‘Sons of the Sleeping Giant’, but thought the album got markedly better after that! Some albums begin so wondrously they make you run naked around the house in sheer delight. Coralspin’s Honey and Lava is one of those. Opener Sons of the Sleeping Giant is a monstrous piece of old school prog like Yes on steroids with the drive of Led Zep in Kashmir mode and the bombast of Queen. Here Ellie Blyth’s piercing vocals operate in territory usually reserved for chaps like Jon Anderson. Coralspin maintain this quality with prog-ballad You’re Wrong, a track edging close to cloying sentimentality, yet with hints of both Renaissance and Queen at their most lush. The rest of album is slightly less convincing. Mistimed and Sky’s End are pleasant, essentially straightforward rock workouts, the latter featuring staggering guitar work from Jake Simmons. Blyth’s voice – like Kate Bush’s – may well split the audience. Blyth’s less edgy than Bush, and her contralto risks becoming repetitve and samey. But doubters should check out the elegant and beautiful Songbird, and in places she just dazzles. Fans of keyboard-driven prog will find a serious feast here, though the first two tunes are the most likely to lead to streaking. Coralspin’s debut album, ‘Honey And Lava’, is everything its title suggests, giving anyone who listens to it a lovely sweet-melty-warm feeling inside. The band is technically very proficient and the instrumentals are tight and engaging, but what really sets them apart is vocalist Ellie Blythe’s unique voice… Their sound has that same weird ethereal quality pioneered by Jefferson Airplane, with Blythe’s dulcet mezzo blending in and out of the complex instrumental harmonies like some kind of slippery sea beast. There are moments when you feel like you’ve zipped right back in time as the band touches on Genesis-esque electronica progressions, but the nostalgia is tempered by the occasional modern twist and subtle light rock motifs… ‘Sons Of The Sleeping Giant’… There is a nice, catchy drum/guitar riff throughout, and interesting harpsichord keyboard effects that make this one of the edgier highlights of the record… ‘You’re Wrong’ is a lovely progressive lilt with a strangely brilliant synth solo and one of Blythe’s best vocal performances. The chorus – “Even though you’re wrong / I’ll give you credit for playing along” – is neat and effective in its simplicity… ‘Sky’s End’ wouldn’t have sounded altogether out of place in an episode of Magnum P.I. (one of the best episodes of the show played the entirety of Genesis’ ‘Mama’ during a chase scene in what can only be described as a seminal TV moment). A middle section featuring some exciting, almost folky progressive instrumentals and a neat little guitar solo makes this one of the best tracks on the record. ‘Songbird’: This piano-heavy tune is a minimalist lament, with all the rich textures of the other tracks stripped right back to expose Blythe’s unique vocals. Her voice is unusually rounded and full, mainly lingering in the lower register to create a smoothly honeyed effect that at times sounds hauntingly inhuman… The persistent, catchy riffs of ‘Night Stalker’ make it one of Coralspin’s more immediately accessible tracks, and it features a nice, lightly distorted guitar solo that brings a little grit to the table. ‘Aching’: The piano/vocal lead-in to this track is reminiscent of Kate Bush (the band name her as one of their many inspirations), and there are some cute jazz turns from the piano that lend it a quirky feel… To sum up, this is a solid debut from Coralspin, with lots of the truly sublime moments we’ve come to expect from a decent progressive outfit. The opener… a good melodic song which lies somewhere between Symphonic and Neo-prog… It takes a while to get used to Blyth’s voice but once done the real value of the songs can be appreciated… “Burn My Eyes”.. there an interlude that cries “Transatlantic” comes a couple of times to increase the listening pleasure. “Sky’s End” has a neo-prog start but goes uptime with a funky guitar. There’s a lot of funk to enjoy. It’s a very good guitar performance on a song which is very rousing specially in the instrumental part. “Night Stalker”… Put it in your car and drive. Piano again for the closer… An excellent final for the album which shows so many influences that is like saying “no influences”. It’s closed by the best song, but all the album is good. It’s a promising band… The album shows good qualities, the band has personality. Let’s see what the future will bring. Coralspin are a band I have never heard of and to be honest the first listen didn’t do much for me. It took several listens to get Honey and Lava to sink in. That is possibly because the lead singer’s voice is a bit odd. Nearest I can find to describe it is Christine McVie of Fleetwood Mac fame. The music is progressive with lashings of synth. Not the most immediate of releases but give it time and you will be rewarded. This review has been widely syndicated, so we’re glad he listened to it more than once! Especially seeing as his comments on some of the other bands he reviewed in that article are brutal! Ellie wasn’t too pleased with her voice being described as ‘a bit odd’ (although Christine McVie is a comparison you can’t complain much about). She wonders whether she has a ‘Marmite voice’ — some people love it, some hate it. I just say it’s good to be distinctive and memorable, and it’s better to have polarized opinions about you, rather than everyone having a bland ‘yeah it’s okay’ view. Just discovered that ‘Marty Dodge’ is actually the estimable Andrew Ian Dodge, libertarian, musician and legend of the UK blogging scene when he lived in the UK a few years back.